Orange Fizz Scented Geranium (p. orange fizz) - Green leathery fan shaped leaves have a wonderful citrus scent. Large pink flowers with darker pink marking on the upper petals. Beautiful in containers. Can be used for culinary purposes. 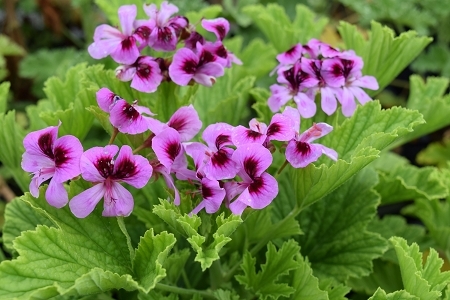 Scented geraniums require a well drained soil and plenty of sunlight. Perennial zones 10-11+ Live plant in 3" container.